They are definitely skittish birds. Although you can't tell from the video (that is until about the 1.15 mark), the urban pheasants in Detroit are very skittish. Over on the East Side, nestled in some of the vacant lots, these beautiful birds go about their business clucking and, in some cases, ducking (more about that later), but try and stop to take a photo or shoot some video? — Heck, no. These fancy birds are skittish and run off at the drop of a hat. 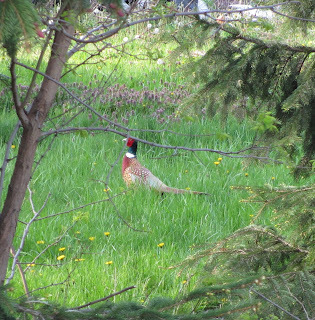 Living in the Islandview Village neighborhood has many benefits, and one of them is catching sight of ring-necked pheasants milling about. It used to be somewhat of a rare occurrence, you would see one here and there, but most often just hear their loud clucking calls early in the morning. However, I don't know if it's because of the mild winter this past year and the pheasant population has gone up, but pheasant spotting has been pretty easy as of late. So I decided to take some photos and maybe even shoot some video to share with you all, but every time I would stop my car, the birds would pick up on my presence and quickly duck for cover. Occasionally, they would fly off, but because they are horrible at flying, they would only go a short distance, to what they consider safety and then scurry away. Recently, though, as I started off on my morning commute, I spotted a pheasant in a clearing. I stopped my car and the pheasant froze and then started to rapidly walk away. He stopped, so I backed up, and he skipped off again. I backed up, and so did he. It was getting ridiculous as we played this back-and-forth game! I finally got out my camera and sure enough, off he went for good. Rather then accept defeat, this only furthered my resolve to capture the elusive pheasant on film. Driving home from work, I started to notice areas where the pheasants would always appear. (I was still hearing one almost every morning and would get the occasional sighting in the alley but only to have my dog scare him away.) It seemed like my best opportunity would be early evening. Sure enough, a couple days later, I come upon some pheasants, and with luck a male and a female, nibbling at some weeds for their dinner. I glide the car over and get the video cam going. As I said earlier, they are skittish, and when I get greedy for better quality footage, I open my car door and off they go. I decide to investigate a dark spot in the brush, and as you see in the video, a not-so-friendly neighbor of the pheasants is looking for his dinner. If for some reason you don't want to watch the video, think: meow. Nevertheless, the video I got was pretty decent, so here it is for your viewing pleasure. And for additional pheasant photos, check out this link to a Flickr Detroit Pheasant Set. So in your travels through the neighborhood, keep an eye out for these colorful birds; just remember they don't care for car doors being opened! 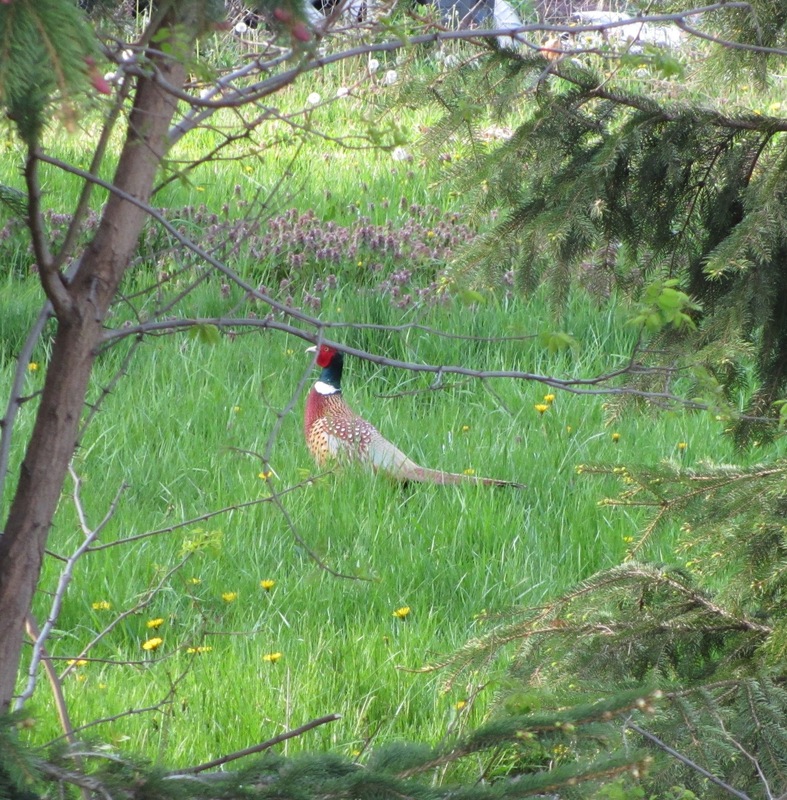 I have Pheasants living in a vacant lot behind my home in Central Village. From what I've recently learned they apparently are in all parts of the city. Beautiful birds aren't they? Thanks for visiting the blog!